Eucalyptus is a diverse genus of trees (rarely shrubs), the members of which dominate the tree flora of Australia. 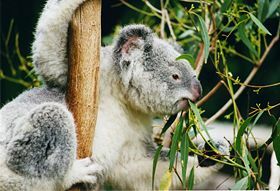 There are more than eight hundred species of Eucalyptus, mostly native to Australia, with a very small number of native species found in parts of adjacent New Guinea and Indonesia and one as far away as the Philippines. The Eucalyptus genus is part of the Myrtle family (Myrtaceae), which is a family of dicotyledon plants—flowering plants whose seed typically contains two embryonic leaves or cotyledons. Eucalypts, as they are also called, can be found in almost every part of the Australian continent, adapted to all of Australia's climatic conditions; in fact, no other continent is so characterized by a single genus of tree as Australia is by Eucalyptus. On the other hand, the deliberate introduction of eucalyptus to other parts of the world, as invasive species, has sometimes resulted in unintended consequences, including deadly wildfires, reduced habitat for native plants and animals, and reduction of valuable wetlands. They serve as a reminder that nature involves many complex interactions, formed over millions of years, and human interventions must not be pursued lightly. 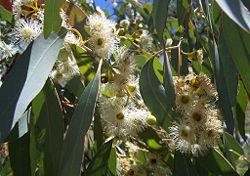 The most readily recognizable characteristics of Eucalyptus species are the distinctive flowers and fruits. 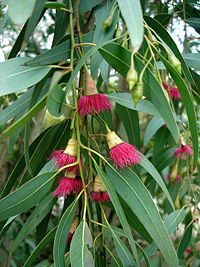 The name Eucalyptus means "well-covered"; it describes the bud cap (technically called an operculum). This cap forms from modified petals and falls off as the flower opens. Thus flowers have no petals, decorating themselves instead with many showy stamens. The woody fruits are roughly cone-shaped and have valves at the end that open to release the seeds. A small genus of similar trees, Angophora, has also been known since the eighteenth century. In 1995, new evidence, largely genetic, indicated that some prominent eucalypt species were actually more closely related to Angophora than to other eucalypts; they were split off into the new genus Corymbia. Although separate, the three groups are allied and it remains acceptable to refer to the members of all three genera Angophora, Corymbia, and Eucalyptus as "eucalypts." Nearly all eucalypts are evergreen, but some tropical species lose their leaves at the end of the dry season. As in other members of the Myrtle family, eucalypt leaves are covered with oil glands. The copious oils produced are an important feature of the genus. Eucalypts also exhibit leaf dimorphism. When young, their leaves are opposite, oval to roundish, and occasionally without a petiole. When one to a few years old, the leaves become alternate, lanceolate to falcate (sickle-shaped), quite slender, and pendulous with longer petioles. The adult leaves of most species, as well as the juvenile leaves of some, are the same on both sides, lacking the distinction between upper and lower surfaces shown by the leaves of most plants. Most species do not flower until adult foliage starts to appear; E. cinerea and E. perriniana are notable exceptions. 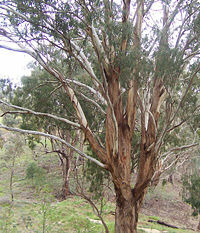 Eucalyptus species have various types of bark. 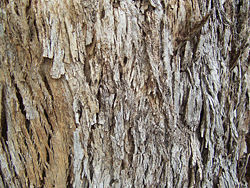 In smooth-barked trees, most of the bark is shed, leaving a smooth surface that is often colorfully mottled. With rough-barked trees the dead bark persists on the tree and dries out. Many trees, however, have smooth bark at the top but rough bark on the trunk or its bottom. Today, specimens of the Australian Mountain Ash, E. regnans, are among the tallest trees in the world at up to 92 meters in height (Hickey, Kostoglou and Sargison 2005) and the tallest of all flowering plants; other taller trees such as the Coast Redwood are all conifers. There is credible evidence, however, that at the time of European settlement of Australia some Mountain Ash were perhaps the tallest plants in the world. 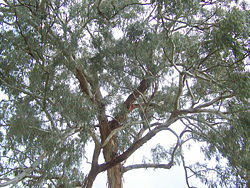 Most eucalypts are not tolerant of frost, or only tolerate light frosts down to –3 °C to –5 °C; the hardiest, are the so-called Snow Gums such as E. pauciflora which is capable of withstanding cold and frost down to about –20 °C. Two sub-species, E. pauciflora niphophila and E. pauciflora debeuzevillei, in particular are even hardier and can tolerate even quite severe continental type winters. Several other species, especially from the high plateau and mountains of central Tasmania, such as E. coccifera, E. subcrenulata, and E. gunnii, have produced extreme cold hardy forms and it is seed procured from these genetically hardy strains that are planted for ornament in colder parts of the world. The coolibah trees, referred to in the song "Waltzing Matilda," are eucalypts E. coolabah and E. microtheca. On warm days, vaporized Eucalyptus oil rises above the bush to create the characteristic distant blue haze of the Australian landscape. Eucalyptus oil is highly flammable (trees have been known to explode) and bush fires can travel easily through the oil-rich air of the tree crowns. The dead bark and fallen branches are also flammable. Eucalypts are well adapted for periodic fires; in fact, most species are dependent on them for spread and regeneration, both from reserve buds under the bark, and from fire-germinated seeds sprouting in the ashes. The Indigenous Australians used, and still use, Eucalyptus for many purposes. The wood was used to make tools and for firewood, the bark for boats, and the leaves to make poison to harvest fish in a waterhole. The leaves and roots were also used as medicine for many ailments. In modern Australia, eucalypts are an important source of timber and their wood is used for construction, furniture making, pulpwood, and firewood. They also serve as windbreaks and ornamental trees and their flowers are a source of honey. Eucalyptus oil is extracted from the leaves and is used as an aroma and a medicinal ingredient, for instance in cough drops. Eucalyptus leaves are also used for decoration in floral arrangements. Eucalypts have a habit of dropping entire branches off as they grow. Eucalyptus forests are littered with dead branches. The Australian Ghost Gum Eucalyptus papuana is also termed the "widow maker," due to the high number of pioneer tree-felling workers who were killed by falling branches. Many deaths were actually caused by simply camping under them, as they shed whole and very large branches to conserve water during periods of drought. For this reason, one should never camp under an overhanging branch. Eucalypts originated between 35 and 50 million years ago, not long after Australia-New Guinea separated from Gondwana, their rise coinciding with an increase in fossil charcoal deposits (suggesting that fire was a factor even then). However, they remained a minor component of the Tertiary rainforest until about 20 million years ago when the gradual drying of the continent and depletion of soil nutrients led to the development of a more open forest type, predominantly Casuarina and Acacia species. With the arrival of the first humans about fifty thousand years ago, fires became much more frequent and the fire-loving eucalypts soon came to account for roughly 70 percent of Australian forest. In the 1850s, many Australians traveled to California in the United States to take part in the Gold Rush. Much of California has similar climate to parts of Australia and some people thought it would be a good idea to introduce Eucalyptus to the state. By the early 1900s, thousands of acres of Eucalyptus were planted with the encouragement of the state government and some city governments. It was hoped that they would provide a renewable source of timber for construction and furniture making. However this did not happen as they proved unsuitable for the task, partly because the trees were cut when they were too young and partly because the Americans did not know how to process the cut trees to prevent the wood from twisting and splitting. One way in which the eucalypts, mainly the Blue Gum (E. globulus), proved valuable in California was in providing windbreaks for highways, orange groves, and other farms in the mostly treeless central part of the state. They are also admired as shade and ornamental trees in many cities and gardens. Eucalyptus forests in California have been criticized because they drive out the native plants and do not support native animals. Wetlands are also reduced as the fast growing plants use a lot of water (Henter 2005). Fire is also a problem. The 1991 Oakland Hills fire, which destroyed almost three thousand homes and killed 25 people, was largely caused, or at least made worse, by large numbers of eucalypts which were growing among the houses in the area. Williams (2002) reports that Blue gum eucalyptus are called "gasoline trees" by firefighters, stating "Blue gum eucalyptus doesn't just burn, it explodes, sending firebrands and seeds shooting hundreds of feet in all directions. Living next to one of these trees is like living next to a fireworks factory staffed by chain-smokers." He further observed that introduced eucalyptus trees blocked drains, tore up pavement, and damaged foundations. In some parts of California, Eucalyptus forests are being cut down and native trees and plants restored. "Eco-terrorists" have also destroyed some trees and are suspected of introducing insect pests from Australia that attack the trees. Eucalypts have been planted in some places around the world to dry up swamps, which happens because of their great consumption of water. This has helped to control malaria because it takes away the breeding places for the mosquitoes that carry the disease. At one time, it was thought that the smell of the trees was what brought the health-giving effects. 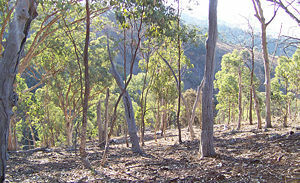 Eucalypts are being grown on plantations in many parts of the world, including the United States, Brazil, Morocco, Portugal, South Africa, Israel, and Spain. Pulpwood for papermaking and Eucalyptus oil are the two most important Eucalyptus products today. The burning of Eucalyptus wood for energy is considered to hold great potential as a renewable energy source. As in California, some Eucalyptus plantations in these nations have been criticized because they replace native vegetation and traditional land uses. Henter, H. 2005. Tree Wars: The Secret Life of Eucalyptus. UCSD Alumni 2(1) (January , 2005, accessed July 12, 2006). Hickey, J. E., P. Kostoglou, and G. J. Sergison. 2005. Tasmania's Tallest Trees]. Forestry Tasmania. (accessed January 27, 2005). Santos, R. 1997. The Eucalyptus of Califonia: Seeds of Good or Seeds of Evil?. Denair, CA:Alley-Cass Publications. Williams, T. 2002. America's Largest Weed. Audubon (January 2002, accessed July 12, 2006). Eucalyptus forest in East Gippsland, Victoria (Australia). Mostly Eucalyptus albens (white box). A log embedded in a Eucalyptus albens (white box) tree. This page was last modified on 29 August 2008, at 13:53.